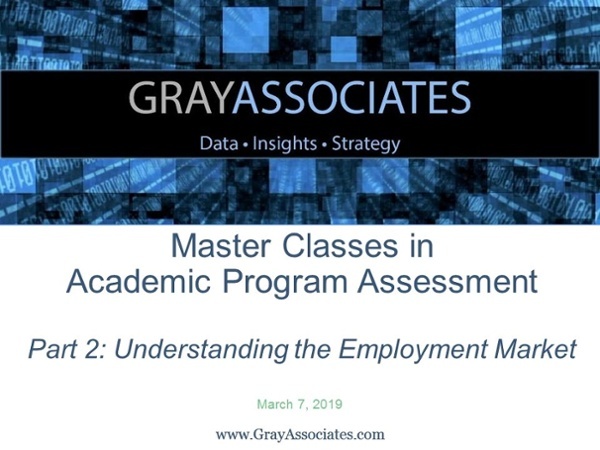 2019 Gray MasterClass: Part 2: Understanding the Employer Market. What are the best sources for employment data? How should they be used? How can I tell if there are enough jobs for my graduates? Where can I find information on how much my graduates are likely to earn? Who provides good data on the skills that graduates will need to succeed in the workplace? Additionally, if you would like a copy of the webcast presentation you can find it here. We hope you will join us for our next Gray Masterclass on April 11th at 2 P.M. Eastern that will examine how to Evaluate Competitive Intensity. We also have our monthly webcast, GRAYREPORTS, where we present and analyze demand trends for higher education programs.